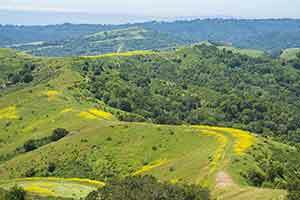 The East Bay Municipal Utility District has made some of its extensive land holdings available for hiking. 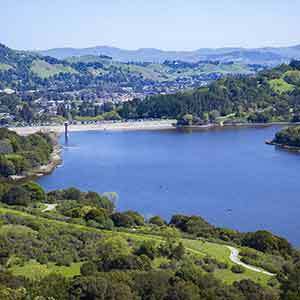 The EBMUD doesn’t have a lot of trails, but the longer ones — especially Briones Reservoir, Rocky Ridge, and Ramage Peak — are among the best in the East Bay for distraction-free long-distance hiking. 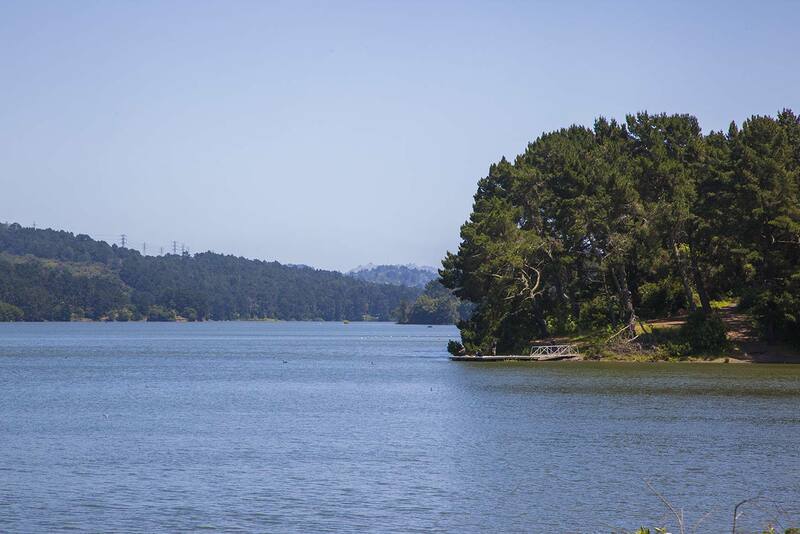 In general the EBMUD trails have fewer visitors, fewer road and trail crossings, and a more remote feel than the East Bay Regional parks. A permit is required to use these trails, and the trails are patrolled to ensure that all visitors have permits. The $10 per year permits can be bought online and printed out on your printer. 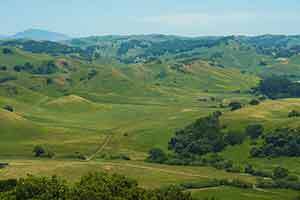 The most remote and challenging trail in the Oakland Hills meanders for miles through attractive woods and grasslands with no sign of suburban development. 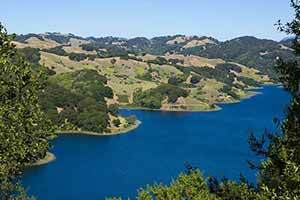 This long loop around Briones Reservoir is the best of the EBMUD trails. Most of the hike is on exposed dirt roads, but the last three and a half miles are on wooded singletrack. 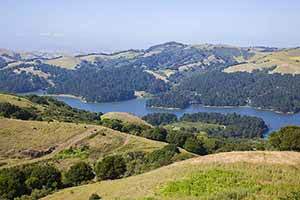 Unlike most EBMUD hikes, this one isn’t remote at all. 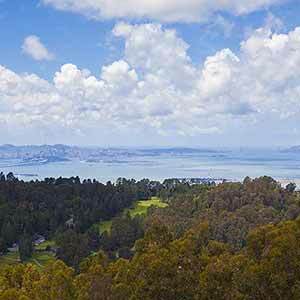 It starts in Berkeley’s busy Tilden Regional Park, climbs over Wildcat Peak, and descends to the popular San Pablo Reservoir before returning over the hill to Berkeley. It’s a fun and enjoyable hike. 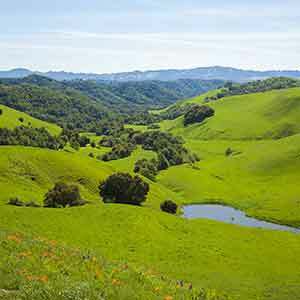 The Pinole Watershed Ridge Trail follows a horseshoe-shaped ridge around a broad, grassy basin. 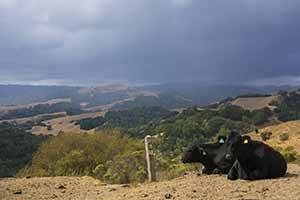 There are nice ridgetop views throughout, but the trail doesn’t have the remote, isolated feel of the best EBMUD trails. 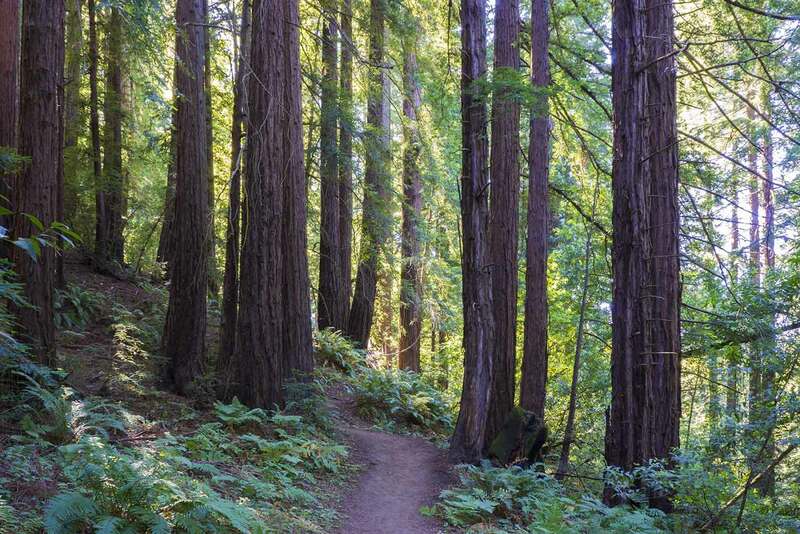 Starting from Cull Canyon, this trail isn’t especially promising at first as it runs through the densely-wooded canyon, but as it climbs out of the canyon and winds over the oak-carpeted hills of the EBMUD watershed, it gradually gets quieter, more remote, and more scenic. 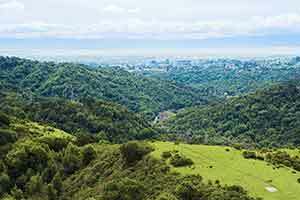 The Rocky Ridge Trail crosses through quiet, open countryside with a sense of remoteness that’s unusual for the East Bay. 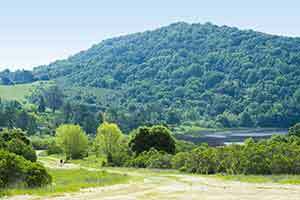 This loop trail is a wide dirt road that mostly runs through the pleasant woods around the Upper San Leandro Reservoir just south of Moraga. Surprisingly, the reservoir isn’t a very prominent part of the hike.